Hollybeary Creations : NND Reveal Day 4!! It's our final day for the August Release Sneaks from Newton's Nook and all the products will be available in the store tomorrow!! 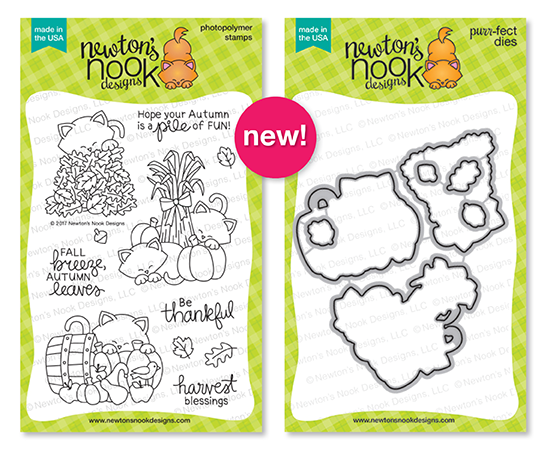 Today we are sharing a Fun new Newton set called Autumn Newton and its coordinating dies. This set is perfect for Fall with Fun images and great sentiments. I used the Newton image with the pile of leaves for my card. I created a Yellow card base and I added some Doodlebug Papers that I die cut with a Stitched Rectangle die. Then I stamped Newton onto some Bristol paper using Brown ink and colored him in with Distress markers and a water brush. I die cut a Frame from some of the additional pattern paper and then used the inner circle to create a background with some Peacock Feathers Distress Ink. I die cut the Newton Image using the coordinating dies and adhered it over the circle with some foam tape. I stamped the sentiment onto the same paper and trimmed it into a banner and adhered it in the upper left corner. I wanted a little more Pop of Blue so I added some Matte Enamel dost from Doodlebug. This is such a Cute image... actually, all the Newton's are! Thanks for Stopping by today !! Great combination of colors! Great card! AND thank you Newton's Nook for a fun week of new releases! Such a cute card! I really like your choice of papers and your coloring looks terrific. SO cute! Love the papers you used! Thanks for sharing! So cute. I like the layout and the papers. Very cute card!! Yes love all of the stamps!! Adorable! I love how you colored the leaves to match the patterned paper. Adorable card--love the way you used the patterned paper! I just love this stamp and how you colored it!! I'm in love with this card! 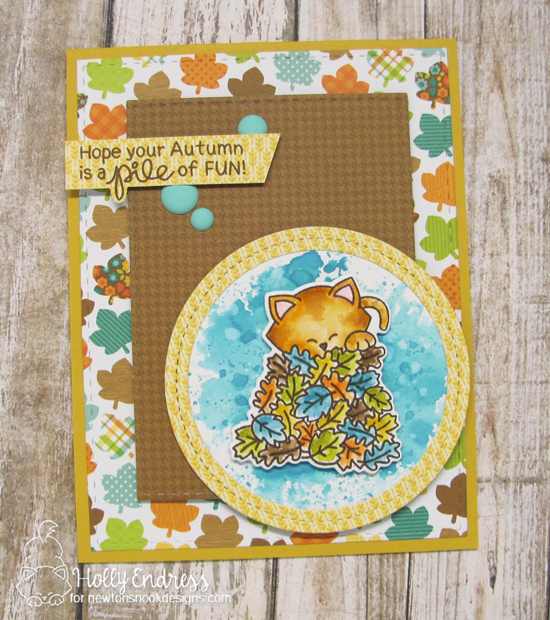 The colors, layout, patterned papers and embellishments are just great! Love the blue in this color scheme. Very cute card...love the blue leaves and the great patterned paper. What am adorable card! Love your watercoloring and the patterned paper! Love the color combinations you used here. The use of traditional fall colors with the lighter blue makes for a vertical pretty design! And I just love these new stamps! The card is just perfect for fall. Love it! Such adorable cards! Great color choices. I just love this card!! The colors are awesome!!! !